And we’re back! I’ve hardly had time to slap some clear polish on my nails in the past few months, let alone create a manicure worthy of a Manicure Monday blog post. Between finding a new job, moving, and planning my sister’s wedding, it’s been a crazy couple of months. But I did it – I’ve settled in and I finally got the chance to give myself a mani (and pedi!) – and I’m feeling a bit more like myself now. For my first manicure in more than a month, I really needed something big, bold, and bright. I needed glitz and I needed glam – lots of it. I prepped my nails – pushed my cuticles, filed, buffed, filed some more – they really needed it after all this time! And then I began my manicure with a coat of Nail Tek II to keep them strong. As I said, I really needed something bold. I wasn’t about to do a natural nail after all this time without polish. 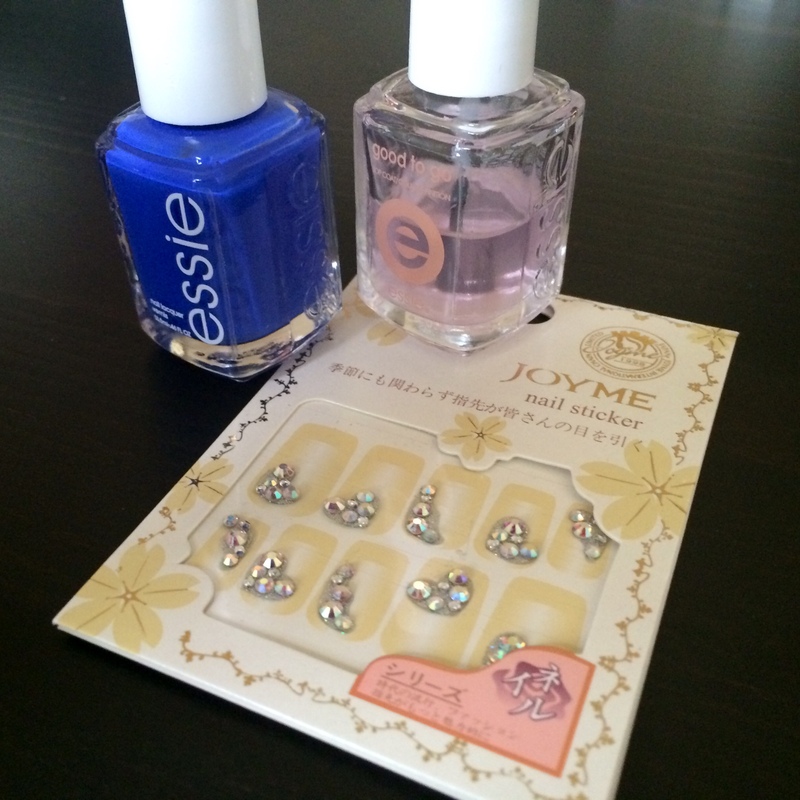 I went with Essie’s Butler Please, a bright, bold cobalt blue. It’s one of my favorite colors and one of my favorite polishes, so why not? Joyme Nail Stickers that I received in my Nail Art Society kit were perfect for the occasion – a simple and easy way to really add a lot of glam to your manicure. 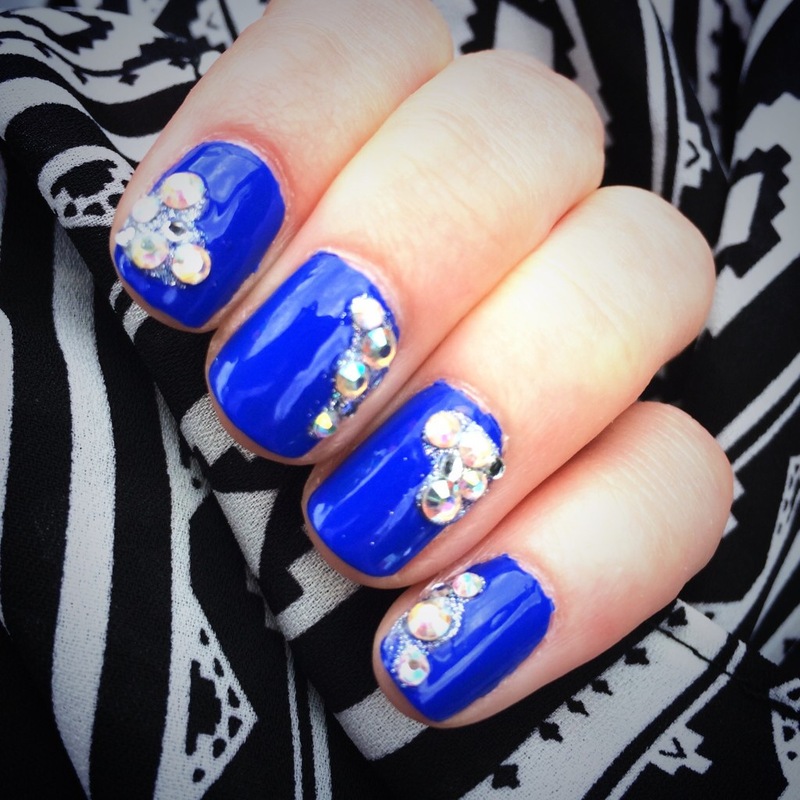 These little clusters of rhinestones may look complicated, but they’re actually all attached into one sticker. I wanted a flashy look, but I hadn’t done my nails in so long, I had to ease myself back in! To use the nail stickers, simply wait until your polish is completely dry, peel off a sticker, and place it on your nail. Seal it with your favorite topcoat – I used Essie’s Good to Go – and you’re … good to go! Sitting here with my perfectly polished nails, typing up this Manicure Monday for you – it’s good to be back! What manicures have I missed while I was gone? Me too! It’s my favorite color.